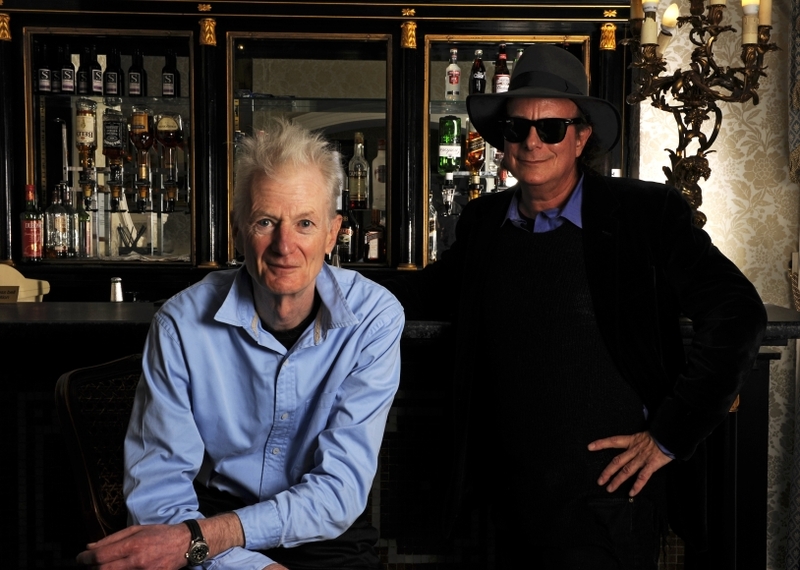 London, UK – Esoteric Recordings are delighted to announce the release of the first album collaboration featuring Peter Hammill, (Van Der Graaf Generator) and Gary Lucas, (Captain Beefheart, Jeff Buckley) . “OTHER WORLD” (EANTCD 1026) is released on 3rd February 2014. The fourteen track recording is a result of an invitation from Peter to Gary suggesting they might convene at the formers studio to see if some musical sparks might fly. Having first met in Aylesbury after a Hammill solo show in 1973, it was not until January 2012 that Gary arrived at the studio armed with instruments and some pieces which might be worth working on. As Peter explains in the notes below, sparks flew and against the odds, “OTHER WORLD” unfolded with seamless speed. The majority of the recordings are produced by Peter and Gary’s guitars and Peter’s vocal though they are aided by a couple of pieces of found sound and loops. The duo are so pleased with the results of the recording that they intend to play live and dates are being booked for early 2014 and will be announced shortly. When Gary arrived at my studio in January 2012 we didn’t exactly have a grand plan about what we were about to attempt. He’d told me that he had some pieces which might be worth working on and that he’d also look forward to creating some improved sonics to which I might add something. For my part I’d prepared some looped pieces, some experimental sound washes and I, too, had a couple of bare-bone song ideas. Fundamentally, though, we probably thought we’d have done well if we managed to get an EP of some sort out of the session. From the first note it became clear that we were on exactly the same wavelength and the project unfolded with seamless speed. After a couple of days we knew that we had the makings of the album. Of course, I still had to spend some time discovering the vocal lines and lyrics which the backing tracks hid within themselves but that, too, came about with some speed. We’ve ended up, I think, with something quite strange but strangely powerful. The music ranges from some kind of roots territory to the wildest of sound collages. All of it – bar a couple of pieces of found sound – is produced by our guitars and my voice. So far, so trad. It has, then, I suppose, some of the characteristics of a warped folk music…from another world. I was a Teenage Anglophile, particularly partial to psychedelic and progressive sounds from the UK, Syd Barrett’s Pink Floyd, Family, Third Ear Band, The Nice, the Move, the Incredible String Band, Kevin Coyne, Dr. Strangely Strange. All were music to my ears then, coming of age as I did in the mid- 60’s in the rather staid and moribund musical climate of Syracuse New York. I sent away for the latest singles from a UK record shop, rare English vinyl that was destined never to show up on US shores. As the music director of Yale’s WYBC in the early 70’s I dj’ed a show entitled “The Sounds from England (and other delicacies)” where I wore the grooves out of my rare English record collection. (The non-English “other delicacies” I spun on my program incidentally were Can, Amon Duul and ironically enough, Captain Beefheart and Tim Buckley). One of my favorite albums in this period I bought solely on the cover art alone in 1969 was Van Der Graaf Generator’s”The Aerosol Grey Machine ,“ a highly atmospheric and mysterious album which I fell in love and played to death for my listeners and friends. In 1973, I took my first trip overseas performing lead electric guitar in the European premiere of Leonard Bernstein’s “Mass” in Vienna with the Yale Symphony Orchestra. On the way back home I stopped in London for the very first time, partially because I had to finally experience it live for myself–and also to hopefully get some interviews with leading musicians for “Zoo World” magazine, a hip music newspaper out of Florida attempting to take on “Rolling Stone”. Wandering into an HMV store on Oxford Street one day after arriving, about to penetrate the wilds of darkest Soho, I met a fellow enthusiast and rabid Peter Hammill fan, so much so that he had cut out a chameleon from styrofoam and installed it in the shop window to promote Peter’s new solo album “Chameleon in the Shadow of Night”. He was a huge fan. He told me excitedly that Peter was performing a rare solo concert up at the Friar’s in Aylesbury later that week. Ringing my pal ZigZag editor Pete Frame, whom I’d bonded with in NYC a few months before at a Genesis show, I arranged to come up to Aylesbury to stay with him for a few days in order to catch this concert. On the night, Peter came on solo after a one-off instrumental set by Zox and the Radar Boys, featuring Phil Collins and Peter Banks and proceeded to blow everyone’s mind with a hypnotic, stark, doom-laden suite of songs featuring his piano, acoustic guitar and that incredible other-worldly voice. After his set I went backstage to interview him, and found him exceedingly nice and friendly. Flash forward to London May 2005. I am seated at Royal Festival Hall with my friends, UK journalist Mike Barnes and former Propaganda vocalist Claudia Brucken, awaiting Van Der Graaf Generator’s historic UK reunion concert. In a season of standout reunion shows I either attended or performed at, including Cream at Royal Albert Hall, Brian Wilson’s “Smile” at Carnegie Hall, and the reunited Magic Band (of which I was a member) at Hammersmith Odeon, this particular concert was my absolute favorite. Peter was as compelling as ever, his powers undiminished. Flash forward another couple years, and through the miracle of the internet we re-connect and Peter was as keen as I was to collaborate, inviting me up to Bath, where we spent a couple days recording in his home studio/laboratory. It was a total dream for me. Having worked closely with many great artists and vocalists, including Don Van Vliet and Jeff Buckley. Peter is right up there as a great creative partner and collaborator. I brought several instrumental pieces to the session, as did he. We’d never exchanged any tapes of our new music previously. The result to my ears is just…well, listen for yourself!! This entry was posted on Thursday, January 16th, 2014 at 21:22	and posted in Peter Hammill & Gary Lucas, Press Release. You can follow any responses to this entry through the RSS 2.0 feed.